Bus from Johor Bahru to Kuala Terengganu is the only long distance public transport connecting the two cities. This is because KTM train network does not cover the state of Terengganu and budget airlines do not offer flight service between Johor Bahru and Kuala Terengganu. Maju Express, Transnasional and KKKL are the reliable coach companies in providing bus service from Johor Bahru to Kuala Terengganu. Maju Express is famous with its thick cushion and spacious seat in the coach, whereas Transnasional provides more schedules to choose from. The duration from Johor Bahru to Kuala Terengganu takes about 7-8 hours depending on traffic condition. The bus fare for bus from Johor Bahru to Kuala Terengganu costs about of RM 48.60. Because of the exchange rate between Singapore Dollar and Malaysia Ringgit, the bus fare is much cheaper for bus departing from Johor Bahru Larkin than the one departing from Singapore. 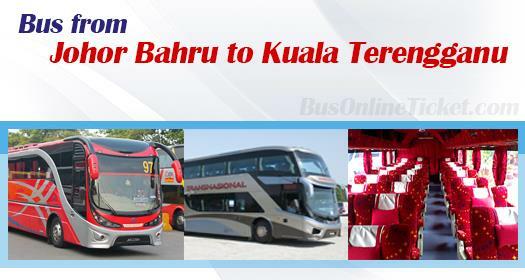 Many budget backpackers in Singapore would travel to Johor Bahru Larkin to take the bus from Johor Bahru to Kuala Terengganu instead of taking bus from Singapore to Kuala Terengganu. There is only 1 daily departure for bus from Singapore to Kuala Terengganu. With this limited daily schedule. Some group of travellers choose to take bus from Johor Bahru to Kuala Terengganu because there are more schedules to choose. In Johor Bahru Larkin bus terminal, there are many notorious touting activities. The best way to avoid it is to purchase the bus ticket in advance via online. They will not continue to disturb you if you have your ticket purchased in advance. Hence, booking your bus ticket at BusOnlineTicket.com is not just hassle-free, but it also helps you to avoid those touting agents in Larkin bus terminal.